Officially licensed License Plate Frame that are usable as a fan decoration on the outside of a standard car license plate, front or back. The frame is molded in durable plastic and is designed around the California standards for tab and sticker clearance. NOTE: Full color frames Prices shown are for a MINIMUM order of 6 plate frames. 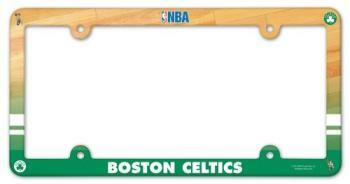 Less than 6 total plate frames will cost $4.50 ea. Mix or match among all team license plate frames. Price discounts are: 12 frames @ $3.10 ea. / 36 frames @ $2.85 ea. / 60+ frames @ $2.60 ea. Made in USA by Wincraft. NOTE: Black frames Prices shown are for a MINIMUM order of 6 plate frames. 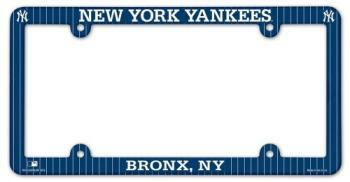 Less than 6 total plate frames will cost $3.50 ea. Mix or match among all team license plate frames. Price discounts are: 12 frames @ $2.30 ea. / 36 frames @ $2.20 ea. / 60+ frames @ $2.05 ea. Officially licensed License Plate Frame that are usable as a fan decoration on the outside of a standard car license plate, front or back. The frame is molded in durable plastic and is designed around the California standards for tab and sticker clearance. The frame is molded in durable plastic and top surface printed with a durable ink on the entire top surface. NOTE: Full color frames Prices shown are for a MINIMUM order of 6 plate frames. 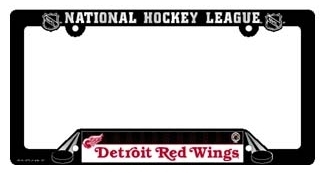 Less than 6 total plate frames will cost $4.00 ea. Mix or match among all team license plate frames. Price discounts are: 12 frames @ $3.10 ea. / 36 frames @ $2.85 ea. / 60+ frames @ $2.60 ea. Made in USA by Wincraft. NOTE: White/Black frames Prices shown are for a MINIMUM order of 6 plate frames. Less than 6 total plate frames will cost $3.50 ea. Mix or match among all team license plate frames. Price discounts are: 12 frames @ $2.30 ea. / 36 frames @ $2.20 ea. / 60+ frames @ $2.05 ea.